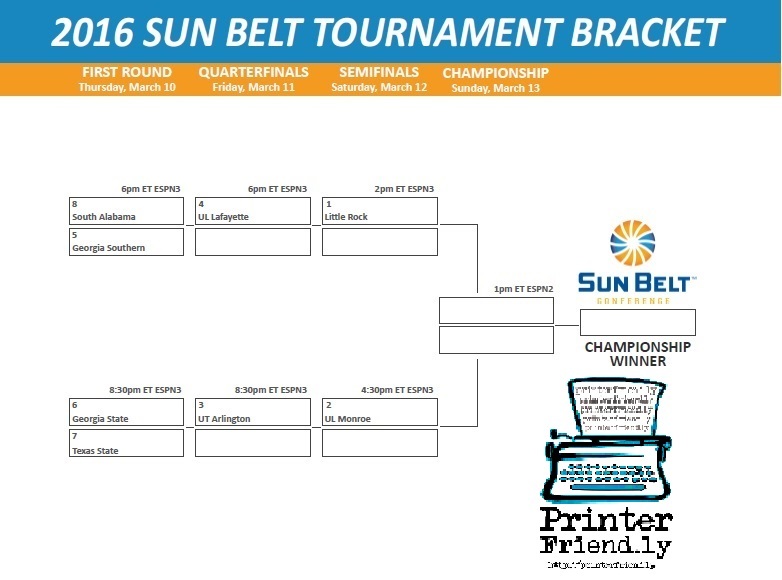 For fans of teams in the Sun Belt Men’s Basketball Conference, it’s time to get your printable 2016 Sun Belt Men’s Tournament bracket. Tourney play is set to kick-off on March 10th, 2016 and will run through March 13th, 2016. This year’s tournament will be held at the Lakefront Arena in New Orleans. The overall champion of the tournament will earn the Sun Belt’s automatic bid to the 2016 NCAA Men’s Basketball tournament. The overall #1 seed for the Sun Belt this year is Arkansas-Little Rock. The #2 is Louisiana-Monroe, and the #3 is Texas-Arlington. Enjoy the action during Championship Week! *Note: All times listed are in Central Time. If you are watching the games on the East Coast, please add one hour. If watching on the West Coast, please subtract two hours to plan out what games you plan to watch. The 2016 Sun Belt Tournament schedule has been finalized and will kick off on March 10th, 2016. We have published a free, printable version of the 2016 tournament bracket for you to enjoy. We also have a blank, 2016 NCAA Tournament Bracket for you to print out to follow the game action in March Madness that gets started before you know it! Let the Madness begin.